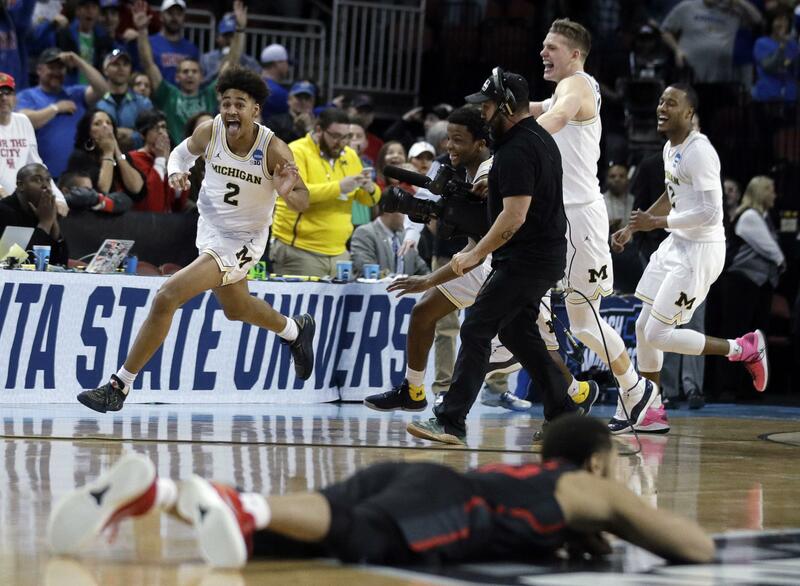 WICHITA, Kan. – Michigan freshman Jordan Poole drained a long 3-pointer at the buzzer after Houston squandered a chance to lock up a spot in the Sweet 16, giving the third-seeded Wolverines a heart-stopping 64-63 victory in the second round of the NCAA Tournament on Saturday night. Devin Davis had a chance to seal the win, but the Cougars’ gritty forward missed a pair of foul shots with 3.6 seconds left. The Wolverines (30-7) called timeout to set up a final play; Muhammad-Ali Abdur-Rahkman found Poole on the wing, and the guard’s shot hit nothing but net. The officials reviewed it to make sure, but Poole had clearly gotten the shot away. Abdur-Rahkman and Moe Wagner scored 12 points apiece to lead Michigan, but it was the unheralded freshman who stole the show. Poole’s flair for the dramatic earned coach John Beilein’s team a trip to Los Angeles for a West Regional semifinal against North Carolina or Texas A&M next week. Rob Gray scored 23 points and Davis finished with 17 for the Cougars (27-8), who were trying to reach their first Sweet 16 since the last of the Phi Slama Jama teams went to the Final Four in 1984. They just about did it. Davis gave the Cougars the lead when he made two free throws with 44.1 seconds left. He pushed the advantage to 63-61 when he made the second of two more foul shots with 24.9 seconds to go. Abdur-Rahkman and Charles Matthews came up empty at the other end for Michigan, and Davis pulled down a crucial rebound, then stalked to the foul line. The senior forward missed both. The down-to-the-wire outcome was hardly surprising given the way the rest of the game went. There were 17 lead changes and 12 ties, including 28-all at halftime. After his huge performance against San Diego State, the Wolverines were wary of Gray every time he touched the ball. They blanketed Houston’s star on the perimeter, cut off lanes to the basket and held him to just eight points on 2-for-11 shooting in the first half. Published: March 17, 2018, 9:58 p.m. Updated: March 17, 2018, 11:46 p.m.